Fashions of the 1930s women represent a time of frugality, but also unique fashions. Glamour, conservative style, and femininity were the defining words of 1930s female fashions. Whereas a youth culture had sprung up and taken firm hold throughout the fashion world during the roaring 1920s, the stock market crash in October 1929 reverberated in every aspect of society. 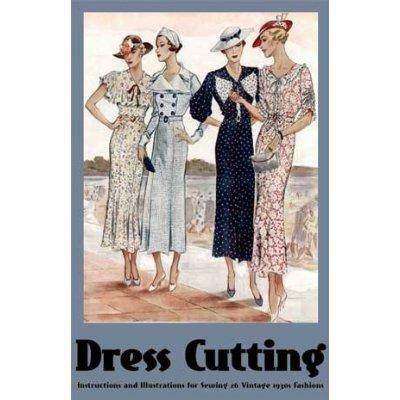 By 1930, the Great Depression had settled in and greatly impacted the fashion world. Women's clothes went from loose tops and dresses that ended at the knees to form-fitting garments that fell to the mid-calf for daywear and to the floor for evening gowns. Fashions turned towards a conservative, traditional look for both both men and women. This is not to say that women's clothing lost all sense of youthfulness. Some fashions of the 1930s woman were almost oppressively girlish, with giant ruffles and bows at the neck and shoulders. Peter Pan collars were often seen on daywear, even for adult women. Although the hard times demanded practicality, there were still many fussy -- even absurd -- hats and winter coats that didn't fasten up the front. On the other side, suits and even trousers were becoming more popular as more women entered the workforce and everyone had less time for frivolity. The daywear of the 1920s had been distinguished by a sporty look, with the emphasis on lightness and fun. There were more practical clothes, such as the suits and other ensembles created by Coco Chanel, but women's suits of the 1930s were more tailored, featuring a harder, more durable style. Shoulders were wider and waists nipped to show off and enhance the feminine figure. The longer skirts, though slim, had pleats or gores to allow for maximum mobility - very necessary when a career girl or hardworking housewife needed to zip around town. Fashions of the 1930s woman were also characterized by the ensemble - matching dresses and coats or suits with blouses. A smart woman chose outfits in basic colors that were flattering, so that although the coat matched the dress, it could also be worn with everything else in her wardrobe. Although skirts were long again, clothes were not as heavy as they had been even as late as the 1910s. This was in part thanks to the development of new fabrics, such as rayon and nylon. Although not as beautiful or elegant as silk, rayon was notably cheaper, which was crucial in such lean times. It also allowed for more inventiveness in prints and dye, so that an inexpensive day or cocktail dress could suddenly have flair and verve. Rayon was easy to wear and care for, which was increasingly crucial throughout the decade and into the war years. Nylon freed women's legs from sags and bags, giving inexpensive new elegance to their look. Silk was warmer, but nylon was more practical. Fashions of the 1930s woman also changed with the advent of the zipper. Now one was less reliant on a maid, sister, mother or husband to finish getting dressed - zippers were easier and faster than tiny buttons. Elsa Schiaparelli, called "Scap" by her friends, is one of the most famous designers of the 1930s. Although known today mostly for her witty, whimsical hats (such as the famous shoe-shaped variety), she continued what Chanel had started, giving women beautiful clothes in classic styles. Her suits were fitted, tailored pieces made exciting by their bold colors. She also designed Marlene Dietrich's classic suit and began the use of shoulder pads. Male designers were still dominant, but women like Chanel and Schiaparelli knew how to give women what they really wanted.